Many songs have been inspired by a film, for example, John Hartford wrote Gentle on my Mind after seeing the 1965 film Doctor Zhivago, Breakfast at Tiffany’s was written after Deep Blue Something singer and songwriter, Todd Pipes, saw Audrey Hepburn in Roman Holiday, but decided that Breakfast at Tiffany’s would make a better song title and this week’s choice, The Ballad of Bonnie And Clyde was another. The film’s music interludes included Deep Night by Rudy Vallee and Foggy Mountain Breakdown by Lester Flatt and Earl Scruggs, to name a couple, but no actual theme. It tells the story of how Clyde, who had recently been released from prison, returns to crime as a bank robber. He meets a waitress, Bonnie, who is bored of her job and life, and together the two form the basis of a gang of bank robbers who terrorise the American southwest in the 1920s. The song went to number one in January 1968 and although the Blue Flames backed Georgie on most of the early singles, they weren’t always credited. Sunny, Sitting in the Park, Because I Love You, Try My World and The Ballad of Bonnie and Clyde all failed to credit the Blue Flames on the label. 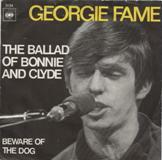 It was Georgie’s third and final UK number one following Yeh Yeh in 1965 and Get Away in 1966. The song did manage to upset some movies goers because they claim it gave away the ending of the film. Fame, whose real name is Clive Powell, continues to record and tour both on his own and as a member of Bill Wyman’s Rhythm Kings. He was also been an on and off member of Van Morrison’s group too. He has two sons, Tristan and James, who are both musicians and in 2010 they all performed together at Twickenham Stadium to celebrate the 10th-birthday celebrations of The Eel Pie Club.